February 2nd 2017. 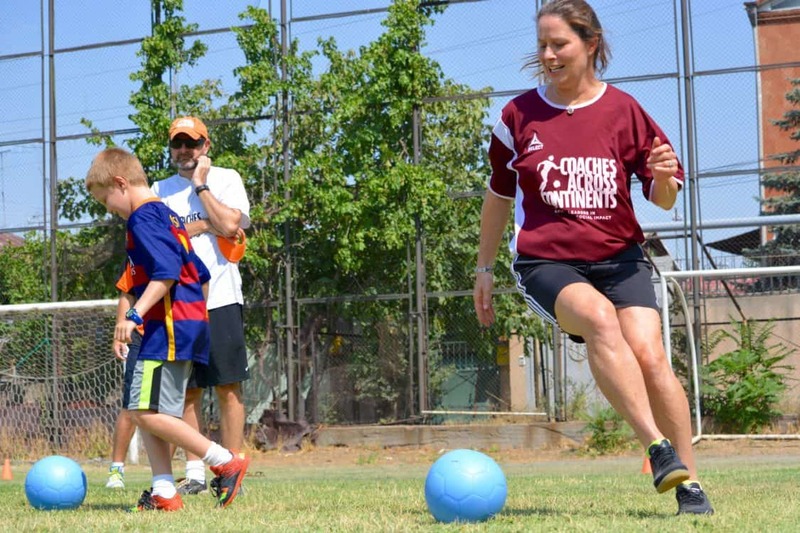 Blog from partner Soccer Sisters, discussing CAC concepts. My fourth-grade son hasn’t missed a homework assignment in 18+ weeks. Talk about a revolution. That’s 18 weeks and counting without him forgetting a single assignment, log signature, reading, permission slip or long-term project.Nothing short of a miracle. For some context, in the past, labeling him lackadaisical would have been a compliment. So what turned him around? Lectures? Bribes? Threats? Nope. He used something called “self-directed learning” from playing games on a soccer field. As an advocate for girls and women in sports, I am a big believer in sport for education and this summer our family took a service trip to Armenia with Coaches Across Continents, the world’s largest charity that uses sport for education. The CAC curriculum relies on “self-directed learning,” which means kids play games based on soccer drills that create conflict and the players solve their problems in order to win or play. The games were fun, but the message repeated over and over again was simple and genius: “Solve your problems. Solve. Your. Own. Problems.” Not the parent/coach mantra of, “Here, let me help you. Let me show you. Do it this way.” The framework for learning was soccer and fun, but the message was unusual. Most of the time, either on or off the field, we tell our kids what and how to do something and think that is the only way to teach or play. When we, as parents, solve our kids’ problems, we are hampering their ability to solve them on their own. In my view, that’s exactly when parents and coaches get tuned out like all the adults in a Charlie Brown cartoon. Remember those? Wah Wah Wah. Blah Blah Blah. Words Words Words. Instead, imagine the fun and challenge of playing games where teams have to move a ball together around a cone with all members of the group touching the ball at the same time but without using their hands or feet. How do you do that? Well, figure it out. Solve your problem. It was simple and genius and I am convinced that something about those games on the soccer field clicked for my son. He learned to take care of fourth-grade business. I have been watching his complete turnaround over the last six months. At first, I thought it had to do with just turning ten. Or being in a different classroom. But this week, I was convinced it was more than that. He has late soccer on Tuesday nights, getting home at 8:45 p.m., still having to eat dinner and shower. Usually he’s too worn out to read after all that, so he does it beforehand. On the way to soccer I asked him if he had completed all his work, and his 30 minutes of required nightly reading. Surprisingly, he hadn’t. Every one of those 18 weeks he got a star sticker for doing all his homework – and he really likes those stickers. I said, “OK. Well, I’m not signing your reading log if you don’t read, so you are just going to have to figure it out.” No signature, no sticker. From the back seat came his answer: “This was totally my fault and my responsibility.” I think my eyebrows reached my hairline. He got there on his own and acknowledged that it was his problem to solve. In the bustle of dinner and dishes, I promptly forgot all about it until I went up to his room after washing up. He was in bed, still in his soccer clothes, finishing his reading. He’d solved his problem. I felt like the Ponce De Leon of parents. How did this happen? Without me doing anything? Then it hit me. William learned it all on a soccer field – and it was fun. I realize that few people have the opportunity to go on a foreign trip with an organization such as CAC, and to learn first-hand the kinds of exercises that focus on “self-directed learning.” But you don’t need a passport and a plane ticket to learn it. So much of it is already ingrained in the culture of sport, in the teambuilding and problem-solving that happens on the pitch at practice every day. For William, the message reached him in a way that 1,000 wah, wah, wah morning lectures on responsibility never would and never did.